Environmental law and philosophy assume the existence of a fundamental state of nature: Before the arrival of Columbus, the Americas were a wilderness untouched by human hand, teeming with wildlife and almost void of native peoples. 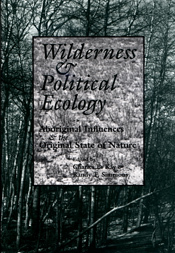 In Wilderness and Political Ecology Charles Kay and Randy Simmons state that this "natural" view of pre-European America is scientifically unsupportable. This volume brings together scholars from a variety of fields as they seek to demonstrate that native people were originally more numerous than once thought and that they were not conservationists in the current sense of the term. Rather, native peoples took an active part in managing their surroundings and wrought changes so extensive that the anthropogenic environment has long been viewed as the natural state of the American ecosystem. Charles Kay is adjunct assistant professor of political science at Utah State University. Aboriginal Use of Fire: Are There Any 'Natural' Plant Communities? : Gerald W. Williams, U.S. Forest Service in Washington D.C.